Our trusted home care agency provides home health care services ranging from 24/7 live-in home care to one hour of senior care companionship. Superior home care is important when you or a loved one are struggling with daily activities due to an illness, a medical procedure, or simply normal aging. Do you need home health care help, but are concerned about having a stranger in your home? How can you find someone you can trust who will confidently provide the help you need? With a hand-picked team of caregivers dedicated to helping others, Homewatch CareGivers offers dependable home health care tailored to each individual’s needs. Homewatch CareGivers understands your desire to maintain independence and your need to feel confident while staying in your own home. With more than 35-years of caregiving experience, our caring home care support team is ready to ensure your continued safety and security at home. 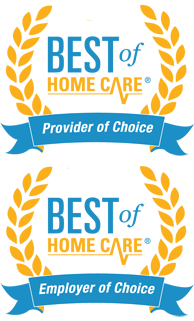 You have many options available to you when searching for a local home care provider. Whether you are searching for personal care services, require assistance with physical therapy, or are in need of skilled nursing care, Homewatch CareGivers will work with you to determine which type of home care will be the most beneficial for you. Homewatch CareGivers employs companions and caregivers, home health aides, certified nursing assistants (CNA), licensed practical nurses (LPN), and registered nurses (RN). In addition to our compassionate team of caregivers, Homewatch services can assist in obtaining durable medical equipment such as a walker, wheelchair, or Hoyer lift if needed. You can reach Homewatch CareGivers 24 hours per day at 847-616-5600 to learn about our full spectrum of support services and affordable senior home care options. The Homewatch CareGivers company was established in 1980, and boasts more than a 35-year track record of success. We pride ourselves in maintaining close ties to our clients and the community. By keeping a local focus, Homewatch CareGivers provides home health services with a caring and personalized approach that makes us stand out from other elder care providers.